I recently got this guy ticking again. Keeping pretty good time. It uses a watch movement that was acquired by Timex in the 60s. Pretty interesting electro-magnetic movement. Super frustrating to work on being magnetic. 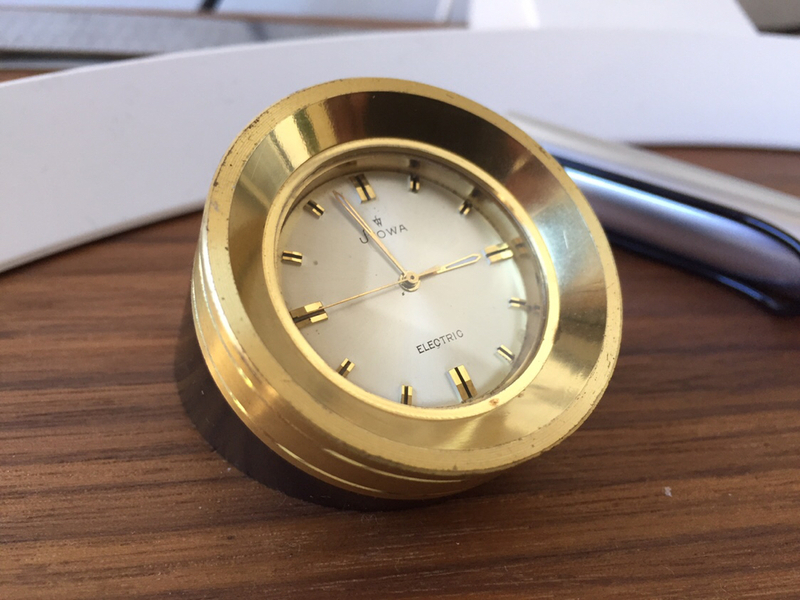 I’ve found a number of working Timex electric watches but can’t find any other desk clocks that use the movement. happyscrappyheropup and miquel99 like this. Those desk watches used wristwatches. Case (no lugs), dial, crystal, movement, back - all put into an outer casing, mostly chrome plated brass. It’s a nice size for a desk. I’d love to see other nice examples. Google for „stowa desk clock“ to find more. Love that! Is it quartz? Thinking it’s not electric because all these Timex movements are back set. You can rate the different sizes of the timepieces by comparing with the AAA-battery (38 mm high, 10 mm diameter). That is an impressive collection! I saw one that likely has a similar electric movement as mine. They seem to be quite rare. That's only part of a collection. I saw one that likely has a similar electric movement as mine. Line 7, #1 - #5; line 7, #6 and line 8, #1 - #3; line 9, #3 - #6. These movements were made by Laco (also situated in Pforzheim). Laco was aquired by Timex in 1961 and sold again a few years later. I can't agree with you. Within the last 15 years I got these plus about 30 more or less identical ones, I didn't see no need to photograph them too. I own a Stowa flight watch, so I'll ask my ? here!